The Blinks are created from morsels of goodness that all the good folk who have ever lived, leave to the Universe. The Blinks novels have been created to help children, young people and their families understand emotional and behavioural issues. More so, they provide strategies and techniques to help manage and change the intensity and duration of problematic behaviours over time. 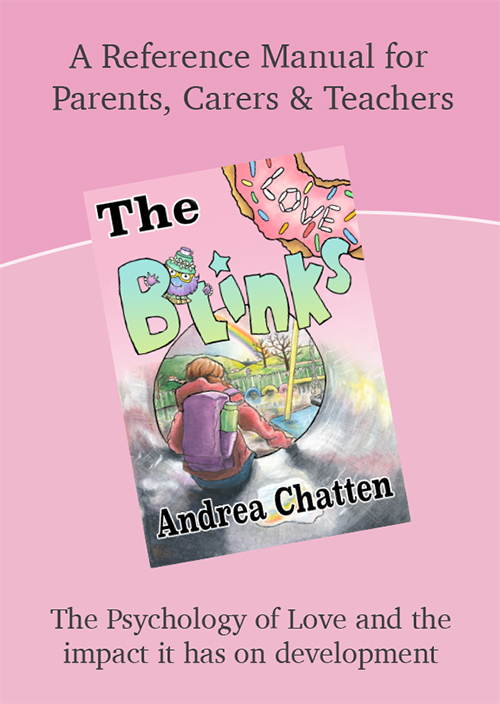 This supportive booklet accompanies the book ‘The Blinks – Love’ written specifically for children and those in their early teens. It provides a deeper understanding of the psychology of how to find and feel love, for parents, carers, and teachers, and how shyness can impact on other developmental issues and all other emotions. It also provides lots of ‘top tips’ on what works best for children and young people whilst growing up and some activity questions that can be used as a starting point to initiate emotive dialogue or discussion with children.